Kansas City Lunch Spots – It shouldn't be this hard to find some place to eat lunch. Excitement was pretty high before this place opened. Haus planned to focus on good beer served in appropriate glasses, artisan sausages from the Local Pig and Belgian style fritten with dipping sauces. That didn’t sound like the typical Martini Corner establishment. Indeed businesses at 31st and Gilham trade in happy hour and late night drinks for young, corporate types and college buddies who enjoy pretty people and a nice setting. Well it turns out that Haus is pretty much exactly that. While a fine place to grab lunch and a beer, it’s not necessarily a place that caters to gourmands or craft beer enthusiasts despite its offerings. It is also a great place to accidentally spend 25 dollars on lunch. Haus experimented with counter service when they first opened, but every time I’ve been back they have offered table service which is much better suited to the space. The waitstaff is comprised almost entirely of young women who wear Haus t-shirts that read something like “I love sausage” on the back, an attempt at humor worthy of Spencer Gifts or the average Morning Zoo radio program. The young men who cook and bus table were not similarly adorned, though I imagine their bros might get a laugh out of it if they were. I doubt the servers are lifers in the service industry and you can tell. Everyone is friendly and gets the job done, but lacks that tacit awareness of when a customer needs attention. Even when when I sit at the bar, the bartenders have a habit of wandering off, talking to customers and taking lengthy orders from outside tables. Call me old-fashioned but I feel that bartenders should at least stay in the same room as the bar. Drinking is serious business after all. The beer list is pretty extensive with an emphasis on Belgian and German brews with a fair number of American craft options as well. I don’t drink a ton of beer at restaurants but the prices seem higher than average. This isn’t a beer blog, however, so I’m going to shut up now. 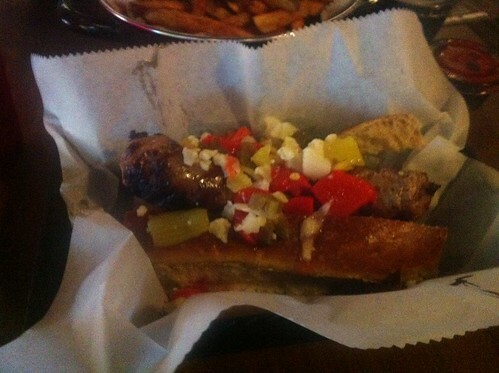 Haus essentially serves sausages, beer and fries. There are a few other things but basically nothing else. The use of the term fritten gives the impression that these french fried potatoes are classier than your average fries. They are not. 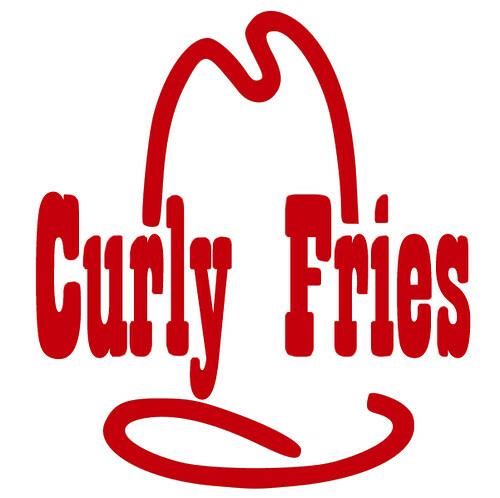 They are hand-cut, well-prepared fries but fail to elicit any sort of extra-special feelings from the nether regions. They are presented in a pile within a fairly cute little crock that somehow doesn’t manage to appeal to the eye as much as a paper cone, metal milkshake cup, or Blanc’s adorable little shopping carts. 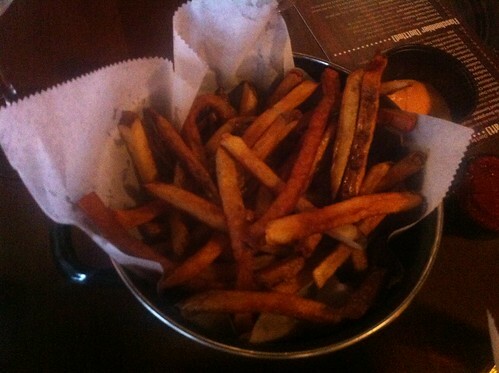 The cut is rather uneven, with an inordinate number of fries coming in around the one-inch length. 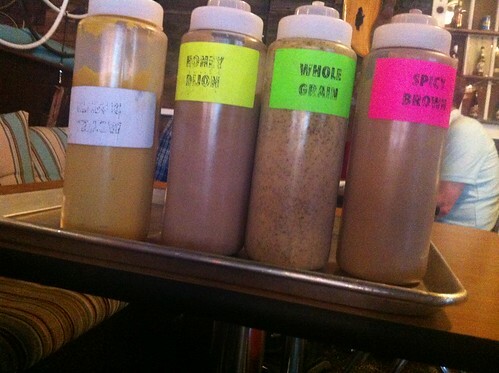 Places that offer an array of dipping sauces make me nervous; it just seems like a gimmick. At Haus, the options are largely adequate if uninspired. Each order of fries comes with your choice of sides: ranch, sun-dried tomato ketchup, sriracha aioli, cucumber yogurt and curry sour cream. Sure, these sound fine but I’d settle for a single choice of great homemade ketchup. Probably the worst aspect is how the sauces are pre-portioned into plastic soufflee cup, plucked ice cold from the refrigerator and dumped unceremoniously at your table as if it were a fast food joint. I assume this is an attempt at portion control and I’m not sure why Haus is so protective. Indeed they offer a few kinds of mustard in large squirt bottles for sausage adorning purposes. At any rate, with a little more focus and rebranding, the fritten could become a side dish worthy of acclaim. It doesn’t help that the fries are basically the only side available. Normally I have no issue with simplicity but I do find myself wishing for another option or two, particularly when I’m in a more health-conscious frame of mind. Since fries are all they offer, it seems like they are worthy of some extra scrutiny. The main event here is the sausage menu. You can choose from about a dozen interesting selections, prepared by The Local Pig, which range in price from $5.99 to $7.99 apiece. The sausages themselves are quite good and generally achieve really excellent texture and flavor. I’ve had most of the options on the menu and found that I really like the traditional bratwurst and the chicken jalepeño pineapple. You should experiment, I don’t think you can make a bad choice. 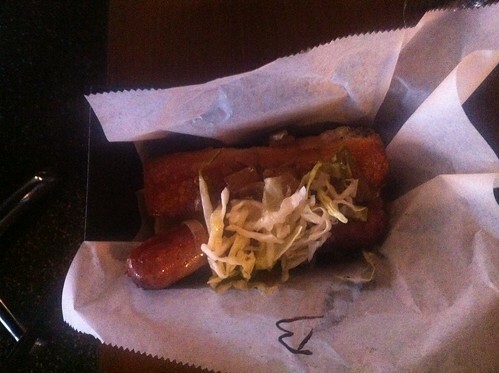 Similar to the fritten, the wurst come with your choice of two toppings. Again, I’m not sure what the thinking is here. I’d prefer a selection of specialty sausages with the toppings pre-selected to fully complement the meat flavors or a whole host of more interesting choices. The options for toppings include jalapenos, sauerkraut, caramelized onions, hot peppers and sweet peppers. They are all somewhat lacking as accompaniments to unusually fine sausages and seem to have been conceived in isolation from the variety of wieners available. The sauerkraut is really more of a quick-pickled, shredded cabbage with none of the briny, fermented qualities of traditional kraut. The onions come in various stages of caramelization each time you order them, but generally should be called “sauteed onions.” After sampling all of the options, I would prefer to eat these sausages without toppings other than the mighty mustard. I’m going on record as not liking the Farm to Market pretzel bun. It’s entirely too substantial and dense for these sausages. The buns are awkwardly split through the top, leaving wide slabs of bread on either side of the sausage. There is not much room for that little wiener to breathe and it subsequently squirts around a lot. The bun is an impediment. If this upsets you as a Farm to Market enthusiast, go read the 50,000 Yelp reviews that gush over the goddamn pretzel bun to get your fix. The interior is nice but a little schizophrenic. It desperately tries to combine rustic and modern design sensibilities and only moderately succeeds. 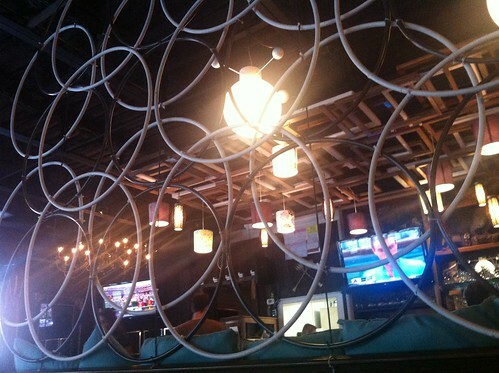 The bamboo encircled beer garden is very nice though. So Haus is fine. Check it out, or don’t. If you haven’t tried a Local Pig sausage it may be worth a trip. In fact, despite this complainy review, I’ve eaten there, like, a million times. 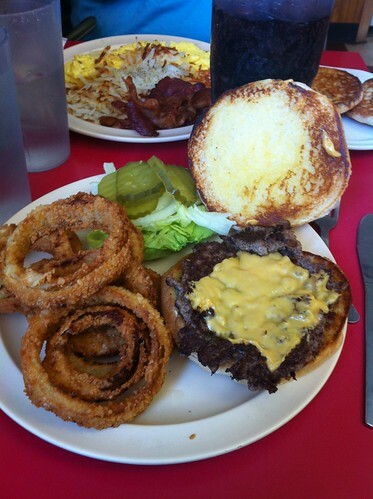 Dagwood’s will surprise you. Everything about the place leads one to expect substandard food — drab interior, haggard clientele, typical menu — but it’s frankly a step above the average diner. It has almost none of the physical character of a “classic” greasy spoon. 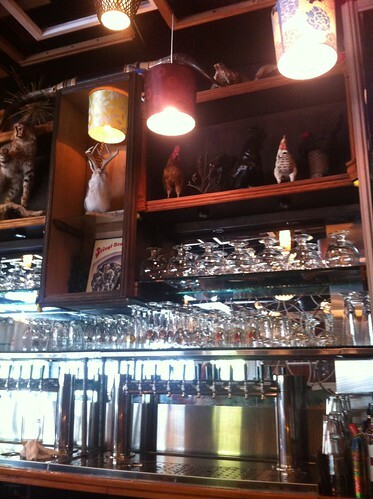 The decor consists of faux-vintage Coca-Cola advertisements and hangable flea market witticisms. While clean, the place shows its age and isn’t particularly comfortable or pleasant to look at. Located in the Rosedale neighborhood at Southwest Boulevard and I-35, Dagwood’s is easily accessible from most parts of the metro, but seems to cater to a mostly local patronage. If you want to see working class KCK in all of its glory, it delivers the goods. While you encounter the occasional brunching hipster, the typical clientele comprises auto mechanics, teenage mothers, extremely hungover young people and impossibly cute old men in trucker caps. There are more unfortunate tattoos on display here than any place outside of Rockfest. Dagwood’s used to enjoy the dubious reputation of being the area’s smokiest restaurant, but in these heady days of personal fitness and concern for public health, it manages to conduct a brisk morning and weekend business in a smoke-free fashion. But I’ll be damned if I’m not impressed nearly every time I eat at Dagwood’s. 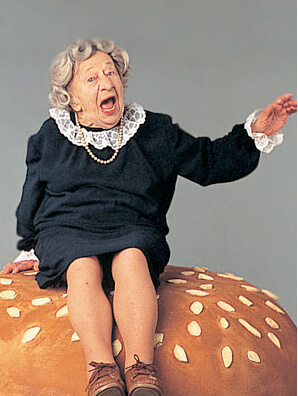 They make a very good burger – it’s thin and griddled to a crisp but is wide enough to feed an average adult human. And here’s the Texas Burger, which comes on grilled sandwich bread with sauteed onions, bacon and a handful of canned jalepeño slices. Can you tell I like the onion rings? I doubt they are hand-breaded but you never know at a place like this. Regardless they are a tasty take on the cracker crumb-breaded style and a nice change of pace from boring old french fries. The lunch selection pales in comparison to the breakfast fare, which is offered all day. As I mentioned previously, I don’t eat breakfast at lunch time, but if that’s your thing, Dagwood’s does a nice job on bacon, eggs, toast, omelets and the like. 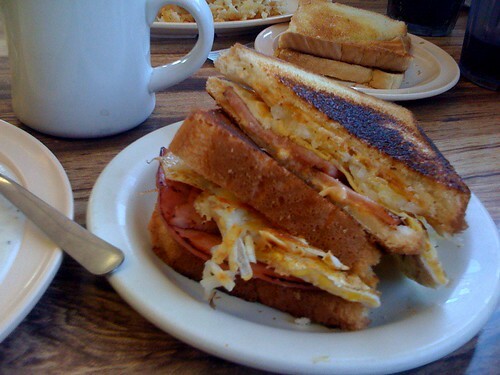 I’ve even written about breakfast at Dagwood’s before. The biscuits and gravy are nothing to sneeze at and the Dagwood sandwich is one of the best breakfast sandwiches in town. The service is generally very good, but the servers can get harried when it’s busy because only one person handles each dining room. Just walk in and take a seat, it might take a minute for someone to greet you and deliver a menu. At the end of your meal, pay at the counter register. I think this used to be a cash-only establishment, but these days they do indeed take cards. 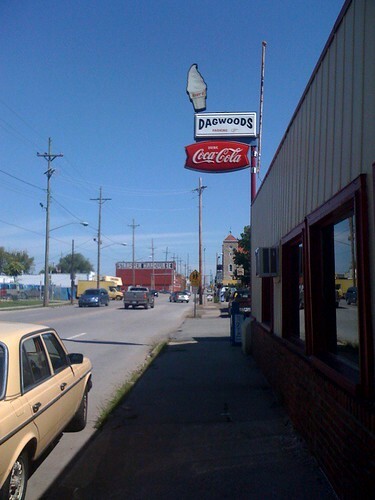 Also, keep in mind that Dagwood’s is a breakfast and lunch place only, so they close around 2pm every day. 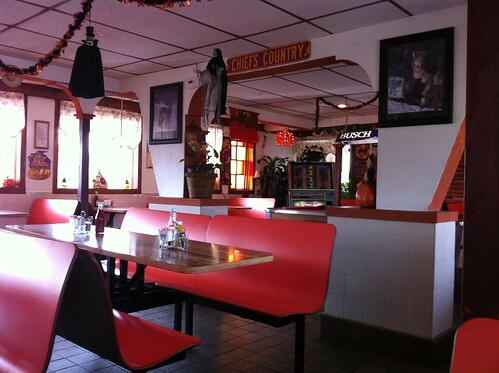 It’s not the most creative menu or prettiest dining room, but Dagwood’s is a solid option for American diner classics. You don’t visit a restaurant like The Big Biscuit because you are a healthy, reasonable human being. You go because you crave only the most traditional, American, brown-colored foods in existence. You go because familiarity assuages the feelings of encroaching culinary strangeness that increasingly ebb out of the television and radio without warning. You go because you want to know what you are talking about when you open the menu, or because your mom wants a “regular” breakfast, or because you are very, very old. 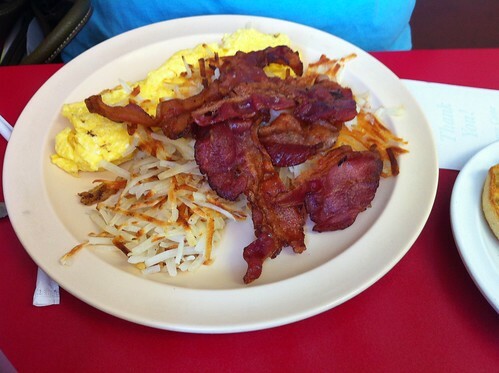 Yes they have a regular breakfast all day here at the Big Biscuit. However, this is a lunch blog, and while people will tell you that it’s OK to eat pancakes and eggs for any meal of the day, I simply don’t agree. If I go out for lunch, I want lunch — sandwiches, soups, entree salads, burgers, sausages, pizza slices, tacos — all the delicious foods that hold a unique and important position in the lunch pantheon and really nowhere else. 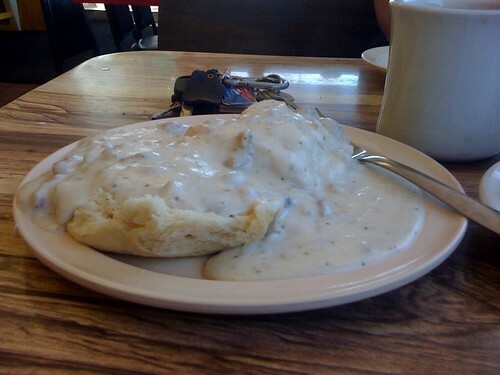 You go ahead and order breakfast at the Big Biscuit if you want, just don’t expect me to talk about it here. 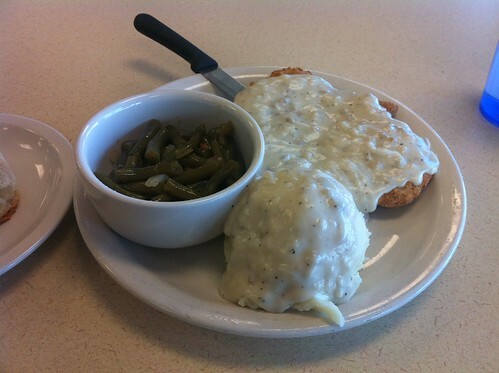 How about chicken fried steak? That’s a lunch dish. 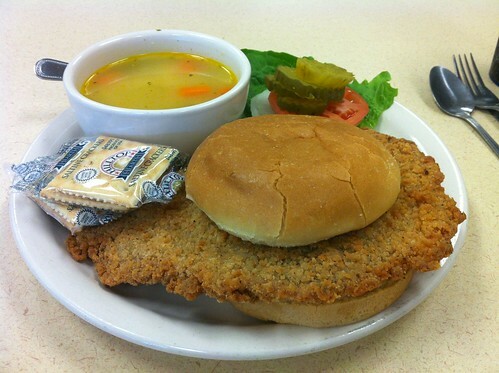 As is a pork tenderloin sandwich. They prepare both of these items with a fair amount of skill and very little inspiration at the Big Biscuit. The meat is tender, the breading is salty and the accoutrements come from a Sysco truck. And really that’s fine. I suspect that the bacon-laden green beans come from a can but I can’t really tell. They are cooked so thoroughly into submission as to bear almost no resemblance to the storied legume in its natural state. The mashed potatoes taste faintly of margarine which severely tempered my enthusiasm for them. 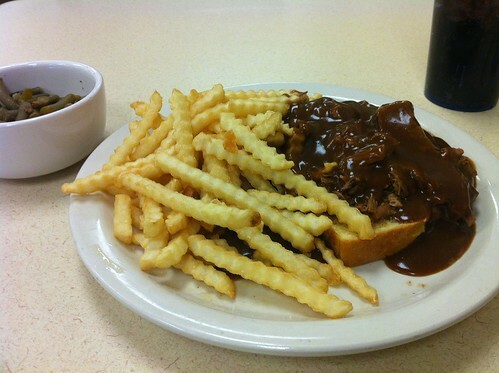 One afternoon I ordered an open-face hot beef sandwich and was somewhat alarmed by the color and consistency of the gravy. I think it’s fair to say that they aren’t roasting bones for a dark and hearty veal stock back in the kitchen of this strip-mall joint, which leads me to believe this gravy is concocted using less than traditional methods. However I ate it, and I ate it all. It was alright. The beef was sliced deli meat and the bread was spongy, enriched Texas-toast style white bread. Someone without teeth could have handled it pretty well. 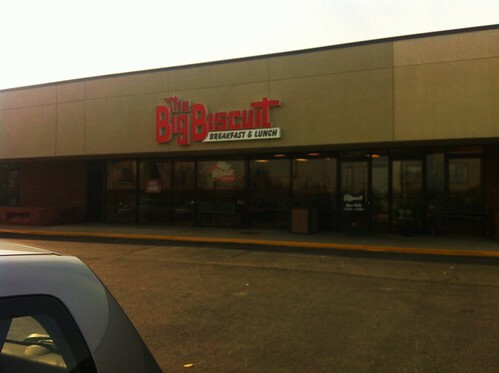 Here’s the thing: don’t go to the Big Biscuit if you are a gastronomic enthusiast. 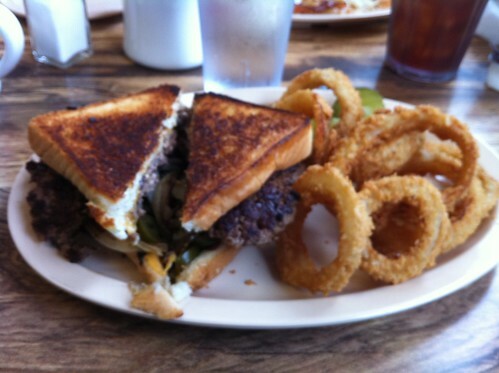 Go because you are stuck in Shawnee, Kansas and feel like eating patty melt. It’s fine to stop by a place like this once in a while to get a fix, and you will probably enjoy it somewhat. The decor matches the food perfectly. It’s boring, clean, uninteresting and somewhat comfortable. 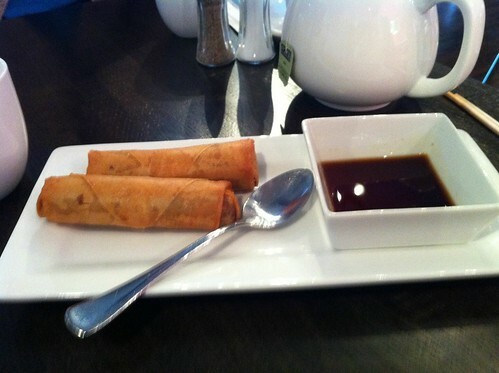 The staff is exceedingly well-trained and the service is quite swift and efficient for the lunch hour. I’ve heard that this place gets busy during prime weekend brunching hours and that service can suffer as a result. Here’s an idea: don’t go out to eat when the free world of eating amateurs is also going out to eat. Brunch is a silly meal. If you would like to start “Kansas City Brunch Spots” feel free, I don’t have any plans. Anyhow, the biscuits are actually pretty good here, which is to say, they chose their name wisely. If only other restaurants similarly advertised what they do best. 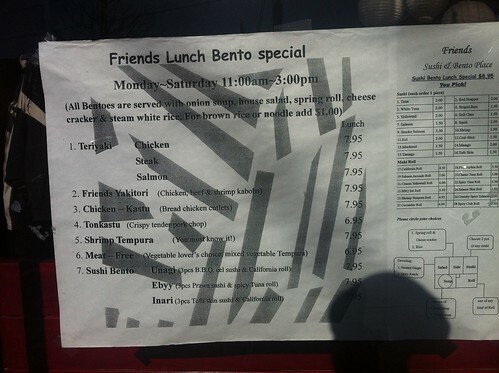 I avoided Friends Sushi for years because of its reputation as “the cheap sushi place” featuring sub-$10 lunch boxes and $1 sushi on Mondays. Having been an early and enthusiastic recipient of Anthony Bourdain’s culinary wisdom nearly a dozen years ago via Kitchen Confidential, I know that Monday fish specials are bad news. I still haven’t visited Friends on sushi Monday, but have to grudgingly admit that this place is pretty good. And it is cheap. Do you know why? Smaller nigiri for starters. What would be a two-bite affair at Edokko or other area sushi restaurants is a small mouthful at Friends. For years I have correlated the size of sushi pieces with the quality of the restaurant, but I’m starting to re-evaluate. Sometimes bigger is better, sometimes it’s not and sometimes it doesn’t make a damn bit of difference. Let’s just say that the motion of the ocean is quite vigorous at Friends. I’m starting to prefer the smaller pieces. I just find it more manageable to eat small nigiri in a single bite rather than awkwardly stuffing a giant hunk of fish into my mouth. Worse yet, attempts at eating nigiri in two bites are almost always disastrous. Once a piece of sushi falls from your chopsticks and is disassembled into it its component parts, it loses any magic it might have had. 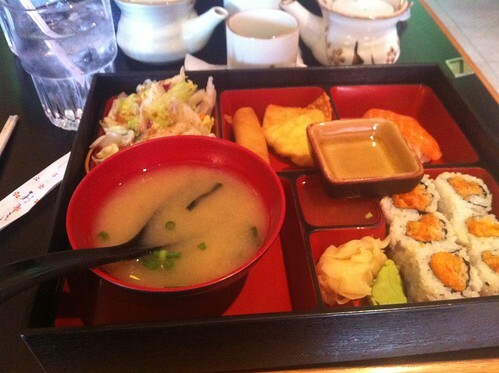 The sushi bento box lunch special gets a lot of attention, and rightly so. For $8.95 you can get two nigiri, one maki roll, soup, a mini-egg roll, salad and crab rangoon (which they hilariously and accurately call a “cheese cracker”). Eating sushi at most places in the United States isn’t going to be a genuine experience of Japanese culinary culture and I suspect that Friends’ bento box lunches are a prime example of that. There are many options for the bento apart from sushi, but I’m not getting anything else if I go to a sushi restuarant. So I’m not saying that this is the best food in the world; I’ll leave that to every other food blog in town. But I am saying that this is a well-sized, affordable lunch special that arrives quickly and tastes good. If money isn’t an issue, by all means order sushi a la carte. I’ve done it and it’s really quite good and still won’t set you back a fortune. And the sushi isn’t sketchy. I’ve never had anything that seemed less than fresh or anything that was cut or prepared oddly. I even tolerated the likely presence of mayonnaise in the spicy crunchy salmon roll and enjoyed it immensely. Friends is the most laid back sushi restaurant I have been to in Kansas City. 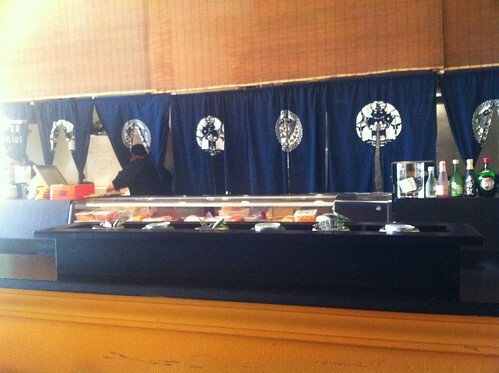 Due to sushi’s elevated price point, most places tend to be slightly fancier affairs. The style of food lends itself well to casual but hip fine dining and semi-douchey night club-esque implementations. Friends is more like the Japanese Succotash with colorful walls (each painted a different bright color), utilitarian furniture and crude design accents like bamboo branches attached to the walls of the dining room. 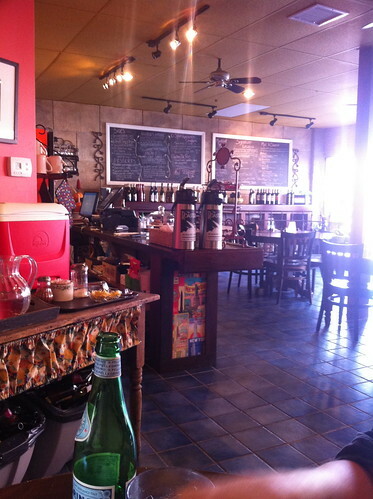 What differentiates it from Succotash is the very good service. There are always plenty of servers available to tend to the dining room as well as a host/ess seating prospective diners. This place is really quite small but fortunately the primary dining room is separated from the entryway, sushi bar and waiting area. It does mean that servers often spend downtime wrapping silverware or doing other sidework at the sushi bar, particularly during lunch. It doesn’t bother me much but it’s a little awkward to have servers performing work other than serving when in full view of customers. That’s all I have to say, not having been eaten there more than a few times. But I thought it was worth saying that Friends isn’t scary, sketchy or gross. 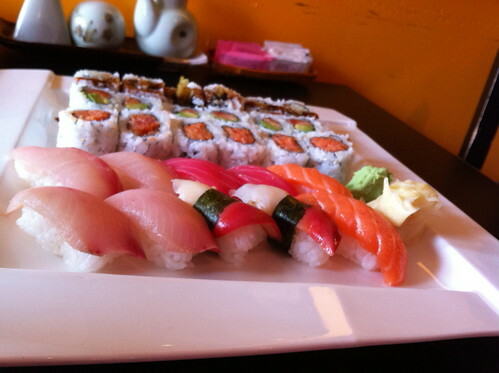 Rather it’s quite good sushi for a good price. Maybe someday I’ll foray farther into the menu. South Overland Park’s One-Bite Japanese Grill has re-made itself and set up shop on Westport road as a classy but casual joint specializing in unusual small plates, noodles and okonomi yaki, among other things. The previous tenant, Matsu Sushi, had not aged well by the time it closed a couple years back. Happily, the space (half of what Matusu was) has been completely stripped down and redesigned in a tastful, minimal style. The east wall is exposed brick, the ceiling is painted tin and a small, orange counter sits near where the sushi bar used to be. Attractive dark wood tables complement the modern chairs. The dining room is almost exclusively 4-tops and 2-tops. One seating area by the front window could perhaps seat 8. This clean, hip decor is accentuated by the soft but noticable strains of a Sirius dance music station. It feels like they are trying a little too hard in this aspect, but at least there were no lyrics to distract me from the business of stuffing my face. I was initially confused by their choice to name the place “Sama Zama” because it sounds gimmicky. But a quick Google search informs me that the term means “varied” in Japanese, which I admit is a perfectly acceptable and appropriate description of the menu. It takes a while to figure out what to order. There are many choices in various configurations: lunch specials, entree portions, appetizers, soups, noodles, desserts, sides and nearly all of them were unfamiliar to me. So it takes time to read and process what is being offered. My dining companion and I each ordered a lunch special which includes two dumplings and a salad with a smaller portion of the main entree. A good selection of regular entrees are available as lunch specials: ramen (spicy or regular), udon, teriyaki, and the aforementioned okonomi yaki in a number of permutations. The raw, marinated octopus appetizer I ordered exhibited wonderful flavor: savory soy punched up with wasabe. 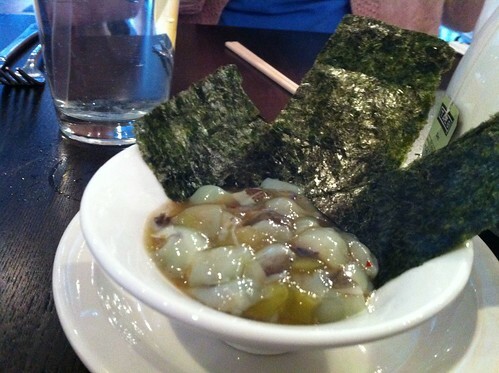 It was presented in a small bowl and garnished with strips of nori. I found myself wanting a different preparation once I took a few bites, not because it was bad but because I grew weary of the consistency of the straight-up octopus chunks without rice or more vegetable to provide a balance of texture. Raw octopus is pretty slimy and doesn’t look very appetizing to the Western eye so all you whities out there should excercise caution if you aren’t feeling a little adventurous. While we ordered the spicy ramen and pork okonomi yaki as lunch specials, we were mistakenly brought full-size portions due to an error by our server who was otherwise quite good. I honestly didn’t realize what had happened until halfway through the meal. The price difference was minimal so I didn’t make a stink and somewhat enjoyed the huge portions we received. Seeing the specials being delivered to other tables, I noticed the portions were much more reasonable and appropriate for lunch. 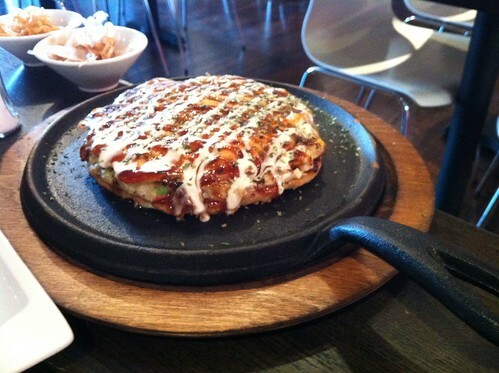 The okonomi yaki is a crazy thing to behold: a pancake topped with meat and vegetables topped with a fried egg. You can choose to further adorn the dish with bonito flakes or little fried wonton strips. I recommend the former. I was somewhat disappointed that the flavors weren’t punched up very high for something so divinely wacky in concept. The pancake portion was exceedingly gummy, leading me to believe that it had been undercooked. Perhaps that’s the way it’s supposed to be? I think it is worth getting if you have never eaten it, but I’ll be ordering differently next time. 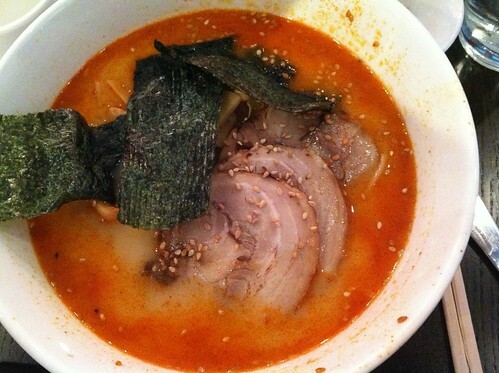 The broth of the spicy ramen, while exhibiting plenty of heat, was similarly lacking depth of flavor. Maybe I’m just a Guy Fieri-esque Phillistine who needs every dish laden with bacon and smoke and spice. The noodles themselves were perfectly cooked and accompanied by delicious, tender slices of pork shoulder. This is the perfect dish for frenzied chopstick slurping. Both entrees apparently came with little fried spring rolls which, while good, were pretty typical of most better Asian restaurants. I’m not accustomed to posting about restaurants when they have been open less than a week but I decided to share my thoughts here nonetheless. Because I hadn’t planned on posting, I can’t recall the specific prices of the things I ordered. I think the ramen was $13 and the okonomi yaki about ten bucks. 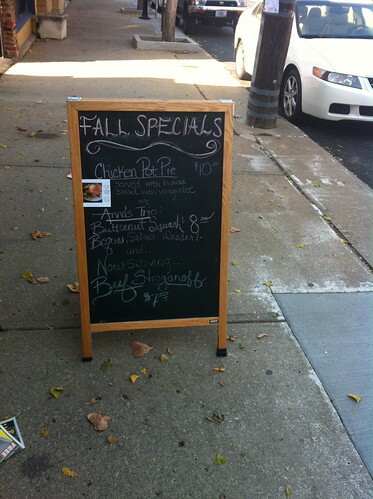 I want to say the lunch specials are about $10 as well. I hope Sama Zama does a good business and I suspect I’ll be back to eat again sooner rather than later. While my experience wasn’t perfect, the menu has a lot to offer and there really isn’t anything like it in town. The Sama Zama website is still under development so the place to go for info right now is their Facebook page. They are open Sunday – Thursday 11 a.m. to 10 p.m. and 11 a.m. to 11 p.m. on Friday and Saturday. Anna’s Oven, a strange combo of tasteful cafe, comfort food emporium and charitable endeavor may have good food but I’ll probably never find out. It’s not the menu or the concept that rubs me the wrong way, but the execution is simply substandard due to an apparent lack of good management and oversight. The space has been attractively renovated and is barely recognizable from its days as Matchstick BBQ, a short-lived but fairly solid breakfast and smoked meat joint on 39th Street West. Given the name and the interior vibe, I would assume that Anna’s Oven specialized in fancy salads, vegetarian fare and overpriced soups, but the menu trends toward updated versions of American classics: meatloaf, roasted chicken, macaroni and cheese and desserts like cobbler and bownies. They open up at 11am and I strolled in about 11:40, eager to try the meatloaf, which Mr. Ferruzza enjoyed on one of his visits. Alas, they were out of meatloaf, which I assume meant that it hadn’t been made yet, given that they had recently opened and there was only one table occupied. The woman at the counter also warned me that they did not have chicken pot pie, which had been prominently advertised on the sandwich board out on the sidewalk. 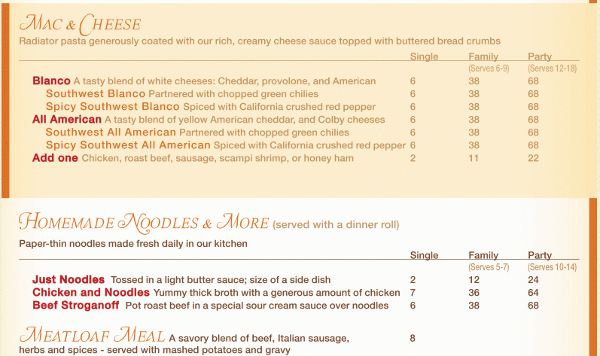 So I opted for chicken and noodles ($7) since it is a relative rarity on local menus and they advertise that the noodles are house-made. The woman from the counter ran the front of the house by herself on my visit and spent a lot of time talking up the charitable aspect of Anna’s Oven with the few customers that strolled in. The business apparently gives a percentage of sales to the Friends of St. Anne, an organization that supports the work of a girls school in Kenya. Being a curmudgeonly old cynic I don’t pay much mind to this sort of thing. After all, what an odd choice of charity. It may have personal importance to the investors of Anna’s Oven, but I have no assurance that a religious school in Africa is more worthy of funds than Harvester’s, Big Brothers/Sisters, Amnesty International or the Heifer Project. Let’s be clear: I think charitable business ventures are an excellent idea, but this one seems too specific. I don’t want to research the charity before spending my money there. And it certainly doesn’t give them a pass to be a crappy restaurant. Anyhow all this chatting about St. Anne’s really cut into the time the server was spending with other customers as more people slowly drifted in. She was supposed to bring out a bottled beverage to my table that took longer than the 25 seconds it should have taken. When she wasn’t with customers she was mincing garlic on a cutting board behind the counter and ignoring everyone. Basically you can forget about getting any attention once you leave the counter. We must have waited 30 minutes for our food, so long that it almost became funny. While we waited I witnessed the wrong order being delivered to another table in the joint, and the wrong order given to a person waiting for takeout. Food was returned to the kitchen and fixed or remade apparently. This didn’t bode well. At least I had a bottle of Boulevard Wheat to keep me company. Imagine my lack of surprise when the chicken and noodles arrived and the waitress explained that these were “not the usual noodles” because “they didn’t leave us any from last night.” What I received was a bowl of store-bought rotini with bits of chicken distributed throughout and maybe a 1/4 cup of watery broth hiding underneath. It was certainly not “yummy thick broth.” There was not even any garnish. Wanna see it? This should really be obvious, but if you advertise house-made noodles in your dish and intend to substitute dried pasta, you should inform the diner first. The dish was completely substandard and highly disappointing. It reminded me of something you make at home when you’re drunk and only have pasta and a leftover chicken carcass. I was annoyed, which you can probably discern from the general tone of this post. But there was no manager to speak to, just an unavailable server and a guy in the kitchen. 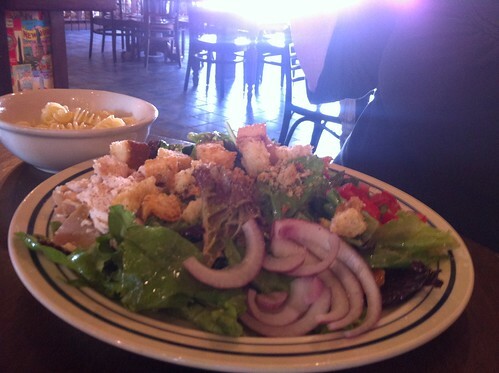 But hey the salad was good. 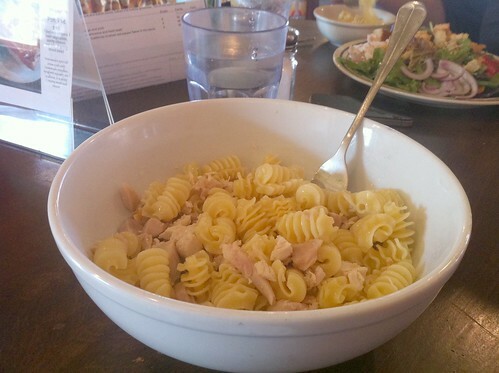 That little bowl in the background is the standard order of regular mac and cheese. Yep, the same store-bought noodles with a thin, slightly sour cheese sauce, and no garnish. This food is literally beige, would it kill them to put a parsley sprig somewhere? The mac didn’t taste all that bad, but was severely underseasoned and didn’t exhibit the best qualities of homestyle mac and cheese: cheesiness, salt. And where was the buttered bread crumb topping as promised on the menu? It certainly didn’t make me want to order the $68 party portion. What am I getting at other than to complain? For starters, it’s clear that Anna’s Oven suffers from a lack of proper oversight and training. Why were there no processes in place to ensure that meatloaf, pot pie and homemade noodles are available every day when they open? Why did the cook and/or server not feel obliged to inform me that they were serving me something different than was advertised? Why was this place so goddamn slow? 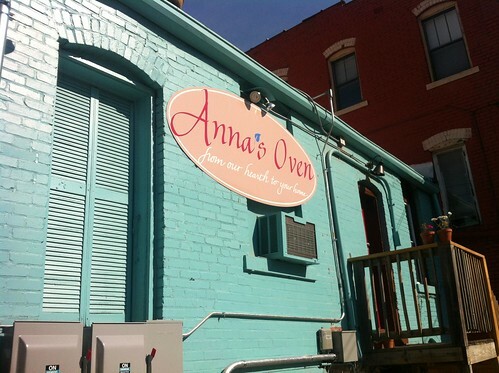 Other than providing a forum to feel good about charitable endeavors, are the owners invested in the success of Anna’s Oven? Does this place have a manager? After being there so long, my lunch felt like an obligation, like being at a timeshare presentation or worse, a bad community theater production against my will. Not long ago, I found a hair in a dish that I ordered from a local restaurant. For many people such an occurrence is a dealbreaker, but after noticing it, I simply removed the hair and proceeded to eat my lunch. The restaurant is a place that I have enjoyed multiple times without incident and I trust them and know that they take pride in their food. But when that trust has yet to be developed, when owners’ work ethic is undetermined and their purpose unclear, missteps turn into grave errors. Almost certainly, I caught Anna’s Oven on an especially bad day. I’m reasonable, I normally would go back to try more dishes and give them a chance to shine before writing this up. After all plenty of people in town seem to like it. But given this one experience I just can’t justify returning. It may not be fair, but there are too many other deserving lunch spots to try. That being said, I would love to hear others’ experiences at Anna’s Oven, mostly to see if I’m insane for being so turned off. It just occurred to me that this January marks the 5th anniversary of Kansas City Lunch Spots. I know I haven’t been the most consistent updater and tend to take long breaks between flurries of posts, but I genuinely appreciate the attention and support of my readers since 2007. I take pride in having been one of the most attentive food bloggers in the area since KC Lunch Spots was started. I started this site out of sheer boredom, disappointed in the selection of downtown lunch spots. Happily the urban core has seen an expansion of food venues for better or worse and I’ve since focused more of my efforts on Johnson County, a fascinating but frustrating place to eat, which happens to be where I work these days. Rest assured that I have no inclination to stop posting about any locale. The intervening years have seen me reporting on a variety of food-related topics but at the heart of it, I want to focus on the unpretentious, easy midday meal. This is why I generally don’t accept invitations to try new dinner menus at restaurants on the Plaza or offers to sample the new lunch fare at joe-sample chain restaurant (believe me, if you have a food blog, you will get offers). I like places that lend themselves particularly well to the life of the regular, working person. Thank you all for reading and commenting. If you want more, like the blog on Facebook or follow me on Twitter. 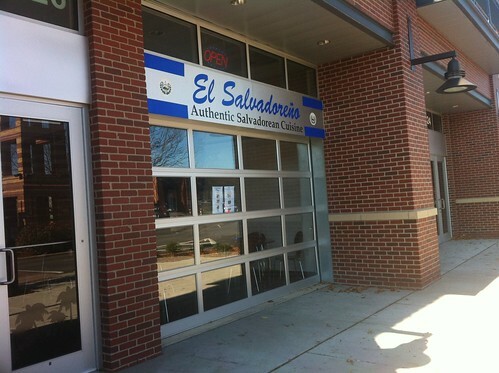 I have eaten at El Salvadoreño a number of times since it opened up across from the Overland Park farmer’s market a few short months ago, and as much as I relish complaining, I don’t really have anything bad to say about it. The cuisine is every bit as authentic and tasty as Johnson County’s other Salvadoran outlet, El Pulgarcito and is dished out in a much tidier and slicker environment. El Pulgarcito seems to attract a more working class Latino clientèle while El Salvadoreño tends toward curious white people off the street, which makes sense given its location at the heart of a small but viable middle class shopping district. However I will not ruminate farther on this matter because it doesn’t really matter. Both restaurants have unique qualities and enough distance between them that I hope they can co-exist comfortably because they are both assets to their communities. El Salvadoreño’s Facebook page proudly declares, “Real Central American Food Made By Real Central American People” – and that’s what is really important isn’t it? El Salvadoreño offers the familiar assortment of pupusas: cheese, pork, loroco, beans and the glorious mix of pork, beans and cheese, sometimes referred to as revueltas. 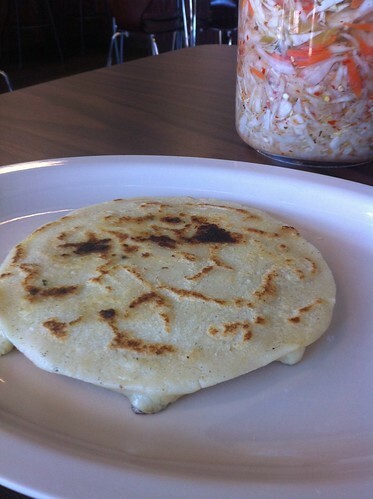 The pupusas arrive fresh of the grill, not too greasy, and have excellent texture and a nicely griddled crust. On one visit I did receive a pupusa that was a tad less griddled than I prefer but to complain would be splitting hairs. 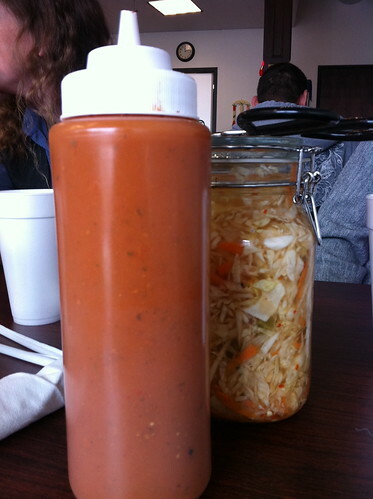 Pupusas arrive with the requisite jar of curtido, a slightly spicy shredded coleslaw accompaniment and red sauce which does not have a strong flavor but does provide much needed moisture to this starch-heavy cuisine. 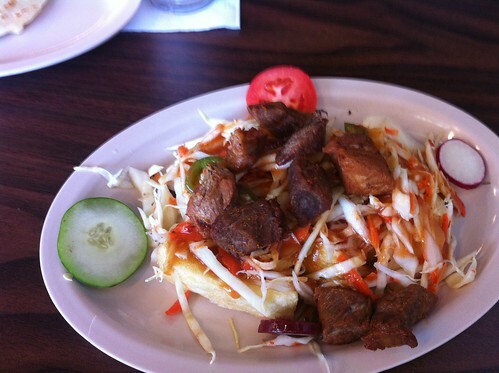 A particularly delicious starch is the fried yuca which comes topped with chunks of fried pork, curtido and sauce. The yuca wedges are expertly fried and incredibly crispy on the outside. At $6.50, yuca frita is one of the cheaper options for lunch if you’re crazy you don’t feel like having pupusas. 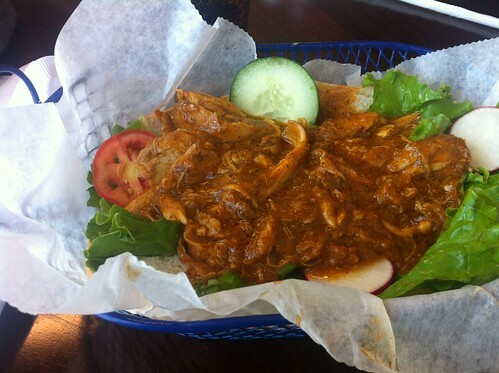 While the menu describes the filling as “roasted, marinated chicken” with a “spoonful of chicken broth” the soft texture and flavor implied that it was poached or stewed, then shredded into a mild, chile-based sauce. This is conjecture as I am completely ignorant of the actual cooking method. A soft French roll serves as the delivery system, along with a few crisp vegetable slices. The pan relleno is also supposed to come with mayonnaise on it, feel free to ruin the sandwich yourself by acquiescing. It is nearly impossible to eat with a knife and fork and even harder to manage with your hands. Like most things wet and sloppy in the world however, this sandwich is worth the effort invested. 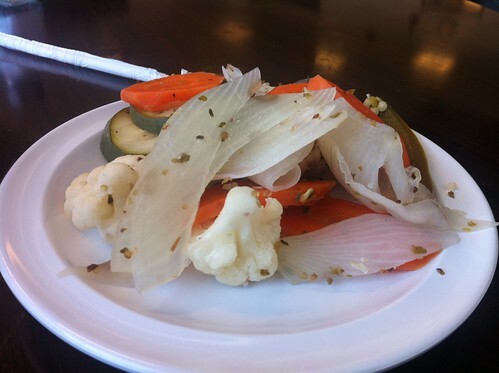 Spring for the escabeche ($1.50) which is a mix of pickled carrots, onions, cauliflower and cucumbers, pointedly spiced with oregano. It makes a splendid crunchy accompaniment to the mild, softness of the pan relleno. I’d be remiss not to mention El Salvadoreño’s superb tamales. The masa has perfect texture: wet but firm, almost like custard. The pork filling is both a humble and decadent option, offering the characteristic tenderness of slow-cooked meats the world over. They have chicken tamales too. The little deep fried pasteles are great too. The ground beef version lacks the flavor punch of the vegetarian pastel but the tomato-cilantro puree that accompanies both makes them equally enjoyable. The service is quite friendly. El Salvadoreño seems to be a family run business and it’s apparent that each person in the kitchen and on the floor have a stake in its success. While small, it’s the kind of dining room that would prove challenging for one server when it fills up. Fortunately there are almost always two people minding the front of the house, something its southerly neighbor, Elsa’s, should pay heed to. 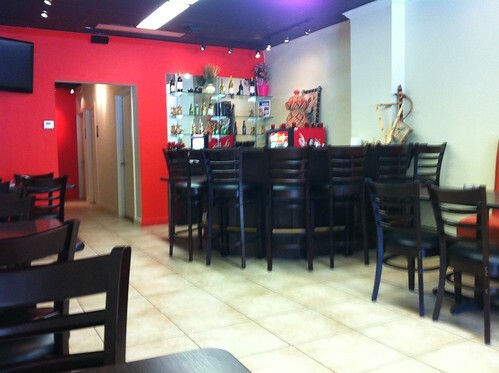 The storefront space is quite modern with high ceilings, bright colors, hard surfaces and metal accents. Interestingly the front wall of the place doubles as a garage door that can be opened in warmer months. This can only be a good thing when the farmer’s market kicks into full gear and the area is crushed with hungry consumers. I admit that part of me prefers the run-down comfort of El Pulgarcito when it comes to this kind of food but there’s no reason to pass it by when you want a good meal in downtown Overland Park. 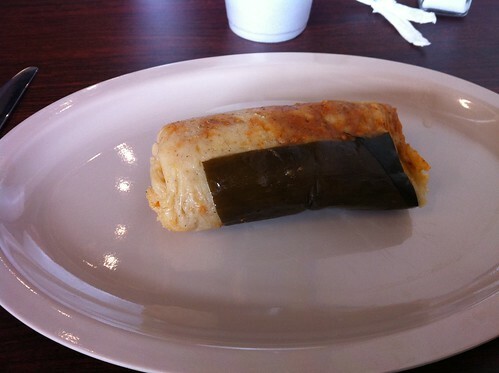 *For native Salvadorans,the pan relleno is not a novelty but rather a hallmark of their traditional cuisine. To others, the dish may across as a little nuts. 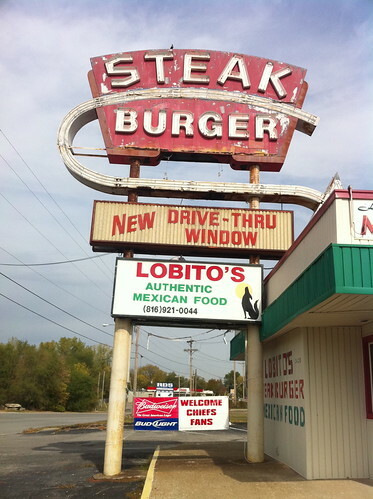 Across the road from the illustrious Hi-Boy burger joint in Independence lies “the other burger place:” Lobito’s Steakburgers, fellow possessor of a kickass vintage sign. By the way, Lobito’s isn’t really a burger joint, despite the name. It’s a Mexican Restaurant, and a pretty good one at that. Certainly there are burgers on the menu, but my guess is that this is a move to placate diners attracted by the sign. I’ve heard the burgers are actually worth trying, but I couldn’t bring myself to pull the trigger. This place was extensively decorated for Halloween when I visited, with fanciful little jack o’ lanterns and skeletons adorning nearly most of the wall space. There are also a number of wolf-themed drawings and photographs; “lobito” means “little wolf” in Spanish. I was also struck by how impeccably clean every surface was. Clearly some sort of re-purposed fast food joint, Lobito’s takes advantage of all the wipe clean surfaces by wiping them clean every chance they get. Seriously, it’s one of the more spotless places I’ve ever been to. Service is quite friendly too. You will be greeted at the door, checked up on by the owner, and thanked as you leave. That will do as much to endear me to a place as good food. Speaking of food, the menu is a gigantic, confusing affair, complete with specials, combo platters, a la carte items, burgers, an extensive breakfast menu and a dessert selection that includes flan and sweet tamales, a relative rarity in these parts. 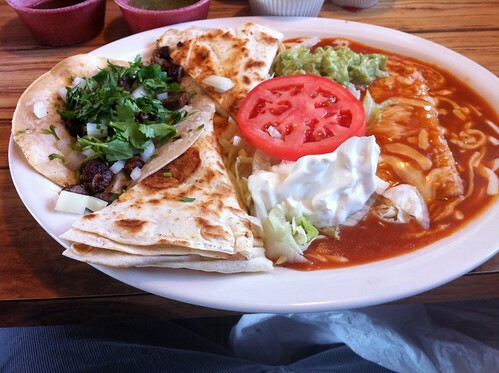 The Mexican fare tends toward Tex-Mex but offers more authentic variations such as Mexican style soft tacos alongside the ground beef and deep fried varieties. The “Lobito’s Plate” features your choice of meat with rice, beans, guacamole, sour cream, some shredded lettuce and a tomato slice. 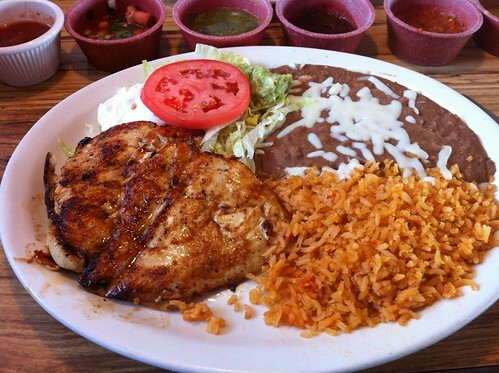 The chicken is a marinated, pounded and grilled breast that tastes simply of lime and salt and is extremely juicy. The rice and beans are passable but nothing special. 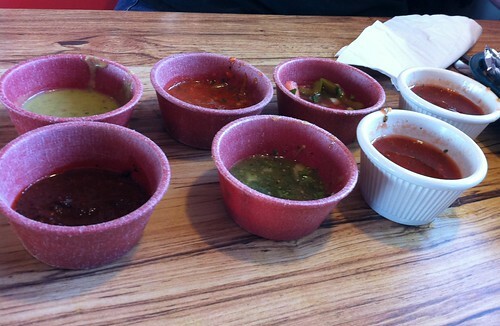 What sets Lobito’s apart is the big selection of salsas available at a little salsa bar in the front of the restaurant. I appreciated having a number of them to try because the food took a longer to come out than one would expect. Normally this kind of gimmick doesn’t do much for me, but I really enjoyed the mild, tomatoey salsa that came with the basket of chips at the table, but also the smoky and spicy chipotle and the sublime salsa verde, accented liberally by black pepper. I also tried a really strange roasted red pepper salsa which I wouldn’t recommend on anything but the pico de gallo and avocado puree are both very good. 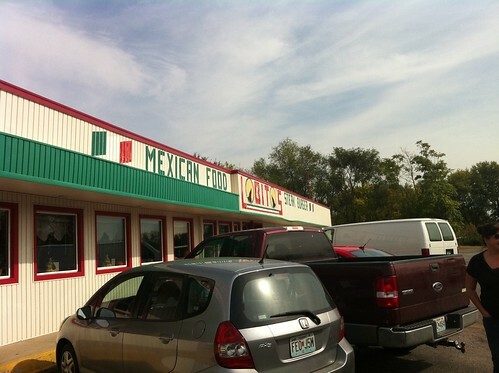 Located close to the Sports Complex, Lobito’s is a perfectly good choice for food coming to or from a game. If Dixon’s and Hi-Boy are too busy or tired give it a try. You can get a beer and can even play pool while you enjoy some very good Mexican fare. Not too long ago, Blue Nile in the City Market was the only game in town in terms of Ethiopian food and I do like the place. Recent years have seen a welcome expansion of Ethiopian restaurants: Marathon (now Mesob Pikliz), a second Blue Nile in Johnson County and midtown’s, Duo. 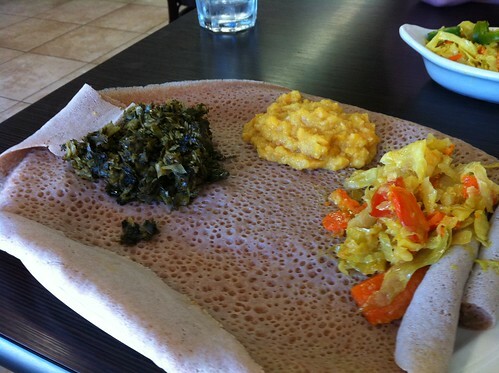 Add Elsa’s, a small somewhat tucked away new Ethiopian restaurant in downtown Overland Park, to the mix and Kansas City has a nice, geographically distributed availability of Ethiopian restaurants. In general I like Elsa’s and the people are just preposterously friendly but I worry that they may have turned some people off early in the game due to disorganized service. You see, after my first Visit to Elsa’s, I was prepared to never return. Elsa’s offers pretty good food, but absolutely clueless service. My workday lunch took over an hour and a half, most of it spent waiting for food, bread, the bill, the corrected bill, the change, and at the end of it all they reported to us that they “couldn’t find” any change. I wasn’t angry, just dumbfounded and almost amused by what a mess the management of this place appeared to be. I’m not someone who demands that servers at international restaurants have a firm grasp of English, but they should be able to communicate in some manner by pointing, gesticulating or something. The young woman who waited on me had a pleasant demeanor but just looked lost and was generally unresponsive. She clearly understood so little of what I said that she didn’t know how to react. I felt terrible for her; it must be incredibly difficult to interact with people all day and not know the language. There are at least two other women and one man involved in the operation of Elsa’s, all of whom speak excellent English. I found it odd that they wouldn’t make themselves more available in the dining room to make sure service was going smoothly. Our server made herself rather scarce when not taking orders or delivering food. I wonder if she was simply avoiding the discomfort of communicating with English speakers. Well my second visit found the whole operation noticeably improved, though not without notable kinks. I’m happy to report that the menu is well-constructed and the prices are affordable. 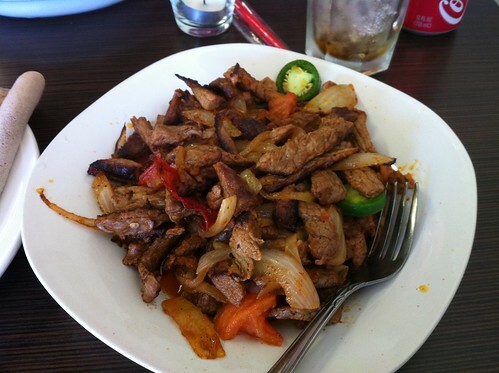 Meat and vegetarian specials allow for one primary dish and two side-dishes for eight or nine bucks. 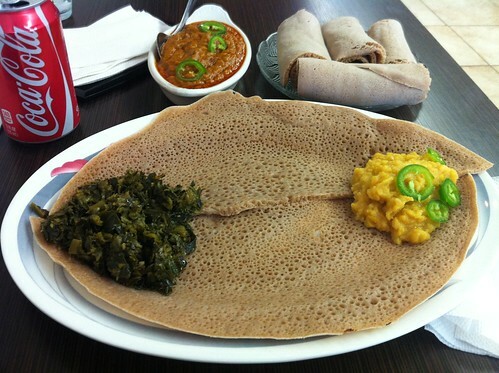 Accompanied by an overflowing plate of injera, the spongy bread that doubles as utensil, these specials offer more than enough food for a midday meal. 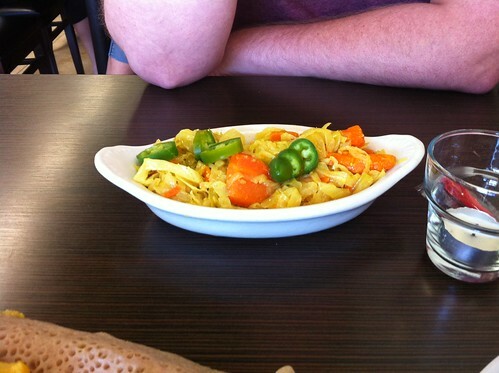 I have eaten plenty of Ethiopian food over the years but have remained pretty ignorant of variances in spicing and preparation. My second time at Elsa’s I ordered the shiro wat, a dish of stewed chick peas but instead received the miser wat, a creamy red lentil item with a very nice spiciness. Despite the mix-up, I willingly ate it and found it delicious and surprisingly rich, no doubt due to the finish of a berbere- based sauce. My favorite item is the kik alicha, a basic but deeply satisfying yellow lentil assemblage. The gomen (chopped collard greens) is not as soft as I typically see it, but has a nice, fresh quality that is missing from most Ethiopian cuisine. Basically the only thing I’ve had that I didn’t care for was a meat dish, the name of which escapes me due to bad notetaking and worse short-term memory. Basically it involved tough chunks of beef that were cooked to death but not enough to soften the flesh into anything pleasantly chewable. The service on the second visit, while problematic, did not get in the way of me enjoying the experience. This was a different server and she also struggled mightily with English. But her consistent smile and pleasant demeanor put me somewhat at ease. Of course I did receive the wrong entree and waited a long time for my check but this meal was enough to keep me from writing off Elsa’s entirely. I can only assume that my first, disappointing visit went south because the restaurant was fairly busy. I saw many problems that first time: wrong orders, errors in timing, MIA waitstaff but the second visit had me eating with only one other table in the place and my food came out quickly. I appreciate that the owner came around to check on me a couple of times; she is a very friendly person and I hope that her restaurant succeeds. At this point in time however, I’ll only visit Elsa’s when I have a lot of time to kill and am dining with patient people.